It’s Friday and we are all looking forward to go on weekend. It seems to be a pretty exiting Friday while we got some comments from the Federal Reserve and expect more economic data. Anyways, we hope you will have good luck and a nice weekend. The USD climbed the most in two month against the JPY after Federal Reserve Chairman Ben S. Bernanke said the central bank is ready to tighten monetary policy once the economy improves, which increased demand for U.S. assets. The JPY also fell against all the other 15 major currencies as Japan’s machinery orders gained less than expected. The JPY fell for a second day against the EUR as machinery orders climbed 0.5 percent in August after dropping 9.3 percent in July, according to the cabinet Office in Tokyo. The EUR/JPY reached a high at 131.48 and is trading close to this level at the moment. 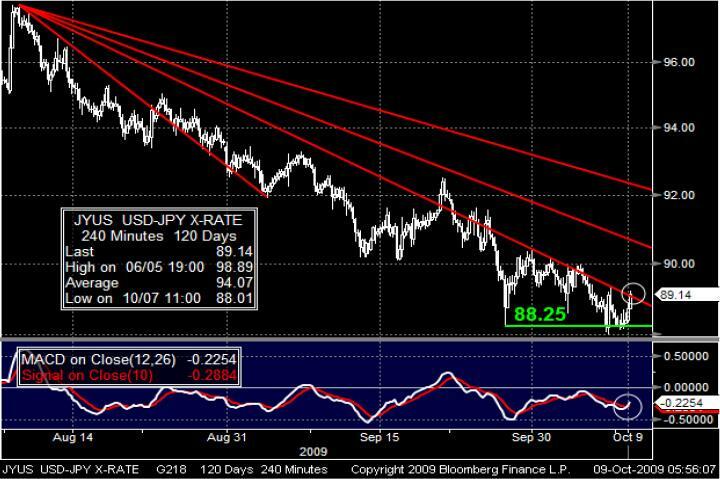 The USD/JPY climbed to 89.13 after touching a high at 89.31. After the first rate increase of all major central banks in Australia, the AUD gained 4.4 percent against the USD this week. It was the biggest climb since the five trading days ended on May 22nd. The big weekly increase was additionally caused by the employed data in the region. The AUD/JPY climbed to an eight week high on speculation that the RBA could increase its key interest rates at its next meeting for the second time in 2009. AUD/USD reached a high at 0.9090 this week, which was the highest level since August 2008. 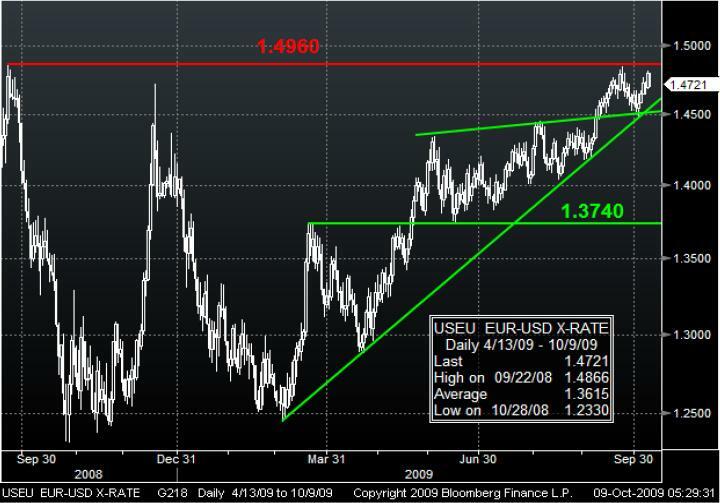 On a long-term view, the EUR/USD recovered its losses from the previews year. It has reached the level of around 1.4960, which is the highest since the end of September 2008. As you can see there are three green support lines, which could give the sign for a break through the long-term resistance of around 1.4960. We may expect further gains if it breaks the red resistance. The weak USD has also lost against the JPY. It already tried since the end of September to break the lower line of the Fibonacci fan. After it touched the 88.25 support level twice, it pulled back and reached repeatedly the lower line of the fan. According to the MACD we may expect a break and further gains inside the bearish Fibonacci fan.